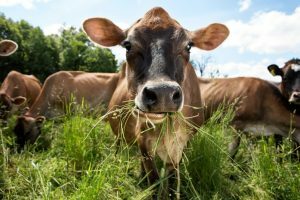 Grass-fed beef has three times the omega 3 fatty acids, 7 times the beta-carotene (a precursor to vitamin A), 10 times the vitamin E and is significantly higher in cancer-fighting antioxidant enzymes, when compared to grain-fed beef, researchers from the Univeristy of California Davis and University of California Chico found. There are two essential fatty acids in human nutrition: omega-3 fatty acids and omega-6 fatty acids. A healthy diet should consist of roughly 1:1 ratio of the two fatty acids, but the standard American eats up to 30 times as many omega-6s than omega-3s, the researchers say. The researchers suggest the high intake of omega 6s combined with the low intake of omega 3s is at least in part to blame for a sharp rise in bad cholesterol, heart disease, diabetes, cancer, Alzheimer’s and several other diseases in the United States since factory farming and grain-feeding became the norm in the 1950s. Historically, most of the beef produced until the 1940’s was from cattle finished on grass. The birth of the feedlot industry during the 1950’s, cattle were fed high energy grains to fatten them for slaughter faster and improve marbling (intramuscular fat). Since then, Americans have grown accustomed to the taste. The cows’ new diet and living “quarters” reduced the omega-3 content of their meat and milk tremendously, while increasing the omega-6 content. The subsequent uptick in bad cholesterol and heart disease “spurred an anti-saturated-fat campaign that reduced consumption animal fats such as meat, dairy and eggs over the last 3 decades,” writes Dr. Cynthia Daley, director of the Regenerative Agriculture Initiative and Organic Dairy Program at UC Chico. However, more recent research suggests that not all saturated fatty acids have the same impact on cholesterol. The omega-3 fatty acids were first discovered in the 1970’s when physicians observed that Eskimos had exceptionally low rates of heart disease and arthritis despite their high-fat diets. The Eskimo studies first established the importance of the omega-3 fatty acid. More recent research has demonstrated that omega-3s play a crucial role in the prevention of atherosclerosis, heart attack, depression, cancer and arthritis, Daley says. Low levels of omega-3 consumption have been linked to low serotonin levels, depression, suicide and Alzheimer’s. Beta-carotene is a precursor vitamin A, a critical fat-soluble vitamin that is important for normal vision, bone growth, reproduction, cell division, and and production of white blood cells. Cows eating fresh grass also get 10 to 12 times more vitamin E than those eating cereal grains, which gets passed on to humans. Antioxidants such as vitamin E protect cells against the effects of free radicals and can prevent or delay coronary heart disease, the researchers write. Grass-fed beef is also “significantly higher” in cancer fighting antioxidants such as glutathione, superoxide dismutase and catalase, the researchers found. “Shifting cows diets from grass to cereal grains will cause a significant change in the fatty acid and antioxidant profile within 30 days of transition,” Daley wrote. We must be doing something right. Our family gave up eating beef some years ago.It actually made my daughter feel ill so we just omitted it from our diet. What happens when they eat Scotts GMO Grass?? School-boy error….should really have used a picture of a herd of beef cattle, not a herd of Jersey Dairy Cows! It said the milk changed also, not just the meat. Omega-3 is actually a polyunsaturated fat, not a saturated fat. Otherwise, good info. Tell me how you kept a herd of cows alive on just grain. I’m absolutely intrigued. Also, what does the use of the word ‘factory’ mean with regard to livestock farming? Did they all live inside a factory? Generally “grain fed” means pesticide resistant or pesticide “expressing” GMO corn and GMO soy feed. “Factory”, is just that, a factory.